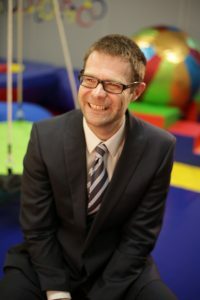 Professor Andrew Whitehouse directs the Autism Research Team at the Telethon Kids Institute (University of Western Australia), and is one of the youngest ever Professors at the University of Western Australia. His research team use a range of methodologies to investigate the early identification and intervention of children with ASD, including molecular genetics, neuroscience, endocrinology and behavioural experiments. Andrew has published over 100 peer-reviewed journals and attracted over $35 million in competitive research grants. He currently writes a popular column on child development for The West Australian and the news website The Conversation, which have attracted over 1 million hits since 2012. Andrew has published one edited book with his twin brother (Ben), and a popular science book that examined the science behind some of the myths of pregnancy and child development (Will Mozart Make My Baby Smart?). Prior to coming to the Telethon Kids Institute, Andrew was a Fellow at the University of Oxford. A perfect fit for Kids Are Kids!, Professor Andrew Whitehouse shares our passion for helping children with disability and making a real difference to their future. He is a true Ambassador of the quality therapy provisions that the team at Kids Are Kids! continue provide to families of WA. Learn more about Andrew and his research as we keep you updated with his blogs and videos. Click below to view. Oxytocin may benefit some children with Autism, but it’s not the next wonder drug. What causes Autism? What we know, don’t know and suspect. Research shows no link to MMR vaccine and autism. Social challenges and support in individuals with ASD. Autism diagnostic standards fall short of the mark. Prenatal and Perinatal factors that may effect the risk of Autism. Mental health in children with Autism. The role of empathy in adults with ASD. The effects of diet on children with Autism. The impact of support services of caregiver stress. The social challenges in support of individuals with ASD. The dream of an Autism School. Fathers age and the risk of ASD. The costs and benefits involved in employing adults with ASD. Sensory differences in individuals with ASD. Sensory issues in individuals with ASD. Choosing the right therapy provider for your child. Developmental regression in children with ASD. The use of Omega-3 fatty acids for young children diagnosed with ASD. The use of Hyperbaric Oxygen Therapy (HBOT) for individuals with ASD. Gender differences between boys and girls diagnosed with ASD. Developmental progression in children with ASD. The last 60 clip for 2016.